Okay, Amy. You've asked a serious question about Canada's residential schools. You want to know what's going on right now in the eighteen hundreds, where you're currently stuck? Well, let me tell you what I've recently learned, since I was taught nothing about it when I went to school. I wonder why? What you are asking about is the fact that Aboriginal children were removed from their families to live in these residential schools. Yes, I agree. How strange. Especially when you consider that the Aboriginal children were indigenous, or original, to Canada. Approximately 150,000 children were placed in residential schools throughout Canada, taking them away from their parents, grandparents, siblings and other family members who loved them and spoke the same language. These schools were in operation from 1831 to 1969. But what about 1867 you ask? What's happening right now in the year you're currently living? Well, as you know, Confederation is happening. The Dominion of Canada is being created, and it includes Ontario (where you live), Quebec, New Brunswick and Nova Scotia. Aboriginal children are being assimilated, or absorbed, into a culture that is not theirs, against their parents' will. They are being forced to have their hair cut, to change their clothes and wear uniforms. Even their names are being changed, or they are simply referred to as a number. They are forbidden to speak their own language. You sound upset. Yes, you're right. It's crazy. Do I think the children are lonely? Yes, the children must be feeling lonely. Two years from now, in 1869, The Act for the Gradual Civilization of the Indian, which calls for "All Indians to be civilized", will be passed. By 1880, eleven schools will be open in the Dominion of Canada. By 1884, traditional Aboriginal ceremonies will be banned. By the late 19th century, 73 schools will be in operation. It was thought at the time that to educate the children and dictate certain religious beliefs in ways unknown to them and their culture would be of benefit. Today we realize the exact opposite is true. You want to know what's going to happen after that? Well, in 1907 the government will start to intervene. A medical inspector will be sent out and he is going to see how poorly run and damaging the schools really are. Nothing much will be done to improve the situation, yet. 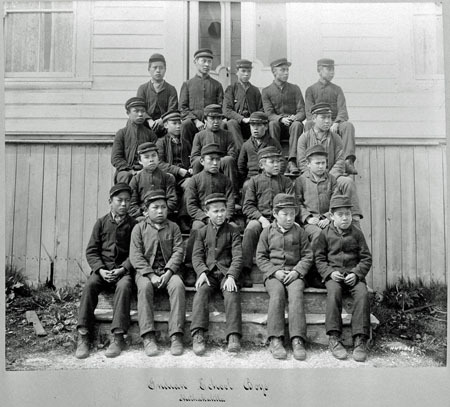 By the 1950s, it will be acknowledged that the residential school program did not work. It won't be until 1951 when the banning of traditional Aboriginal practices and ceremonies will be removed. In 1958 Indian Affairs inspectors will recommend the closures of the residential schools. Still, there will be the 1960s "scoop", where thousands of Aboriginal children are removed from their parents; most will be placed in foster homes. Why not help them in their own homes if they need help you're asking? Great question. I wish I had the answer for you. In 1982, The Constitution Act will be amended to recognize the right of the Indian, Inuit and Metis peoples of Canada. In 1996, the last federal residential school will be closed in Saskatchewan.